This entry was posted in Series and tagged 50 steps 100 steps., almost the same no difference, bojagi, cloth covering, expression, It makes no difference since they’re almost the same., Nevermind that it’s 50 steps or 100 steps. 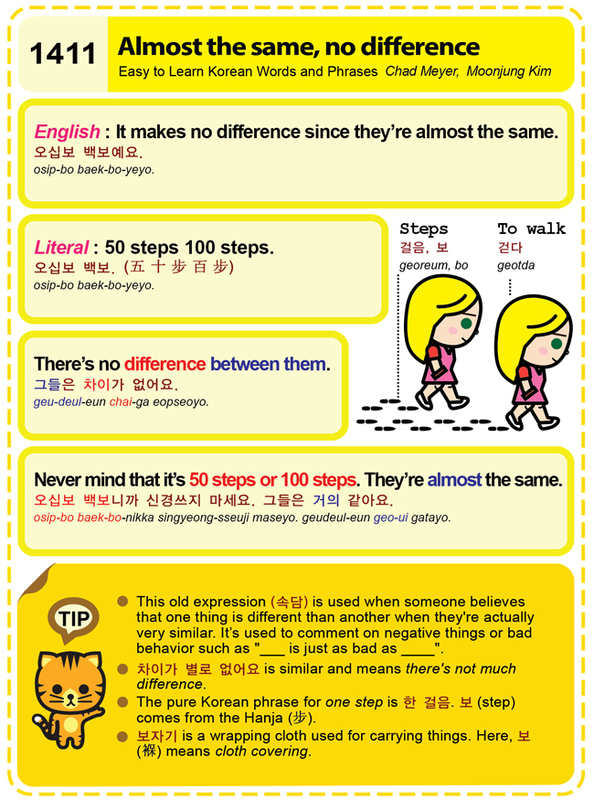 They’re almost the same., someone believes that one thing is different than another when they're actually very similar, step, steps, There’s no difference between them., to walk, 步, 褓, 걷다, 걸음, 보, 보자기, 속담, 오십보 백보. (五 十 步 百 步), 오십보 백보니까 신경쓰지 마세요. 그들은 거의 같아요., 오십보 백보예요., 차이가 별로 없어요, 한 걸음 by easykorean. Bookmark the permalink.